﻿ 1 John 5:12 He who has the Son has the life; he who does not have the Son of God does not have the life. 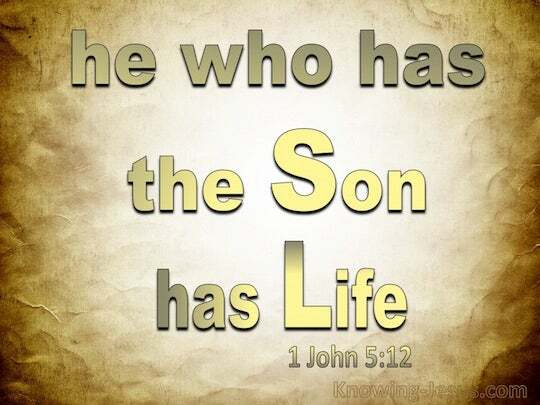 The one who has the Son has life. The one who doesn't have the Son of God does not have life. The person who has the Son has this life. The person who does not have the Son of God does not have this life. He who has the Son has the life. He who does not have the Son of God does not have the life. He who possesses the Son has that life; he who does not possess the Son of God does not have that life. The person who has the Son [in his heart] possesses this "life;" the one who does not have the Son of God does not possess this "life." He that has the Son, has life: he that has not the Son of God, has not life. He who has the Son has the life; he who has not the Son of God has not the life. he that receives the son, is intitled to life; and he that does not receive the son of God, has no title to life. He who has the Son, has this life; he who has not the Son of God, has not this life. The one having the Son has the life; the one not having the Son of God has not the life. Whoever has the Son has life; whoever has not the Son has not life. He that has the Son has life; and he that does not have the Son of God does not have life. He having the Son has life; and he not having the Son of God has not life. He that has the Son has life; and he that has not the Son of God has not life. The one who has the Son has the life; the one who does not have the Son of God does not have the life. He that hath the son, hath life: and he that hath not the son of God, hath not life. He who possesses the Son possesses life: he who does not possess the Son does not possess life. The one who has the Son has this eternal life; the one who does not have the Son of God does not have this eternal life. He who has the Son has the life. He who does not have God's Son does not have the life. He that has the Son has the life; he that has not the Son has not the life. He that hath the Son, hath, the life, - he that hath not the Son of God, hath not, the life. He that hath the Son, hath this life; and he that hath not the Son of God, hath not this life. He who finds the Son finds Life; he who does not find the Son of God does not find Life. 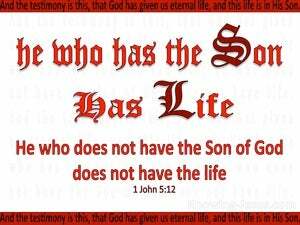 He that hath the Son, hath life; and he that hath not the Son of God, hath not life. He who has the Son has the Life: he who has not the Son of God has not the Life. Whoever has the Son has life; whoever does not have the Son does not have life. He who has the Son has the life. He who doesn't have God's Son doesn't have the life. He that has the Son has the life; he that has not the Son of God has not the life. He that hath the Son hath life: he that hath not the Son of God hath not life. he who is having the Son, hath the life; he who is not having the Son of God -- the life he hath not. 11 And the testimony is this, that God has given us eternal life, and this life is in His Son. 12 He who has the Son has the life; he who does not have the Son of God does not have the life. 13 These things I have written to you who believe in the name of the Son of God, so that you may know that you have eternal life.